The acclaimed independent vampire flick will bite into Blu-ray this August. 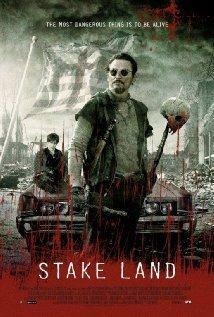 In an early announcement to retailers, MPI has slated 'Stake Land' for high-definition on August 2. Connor Paolo ("Glee") stars as Martin, a young man traveling with only his taciturn mentor - a hardened fighter known simply as Mister - as protection against this blasted earth in search of the rumoured safe haven of New Eden. Winner of the Midnight Madness Award at the Toronto International Film Festival and hailed as "the American horror film of the year" (Todd Brown, TwitchFilm.com), 'Stake Land' establishes director Jim Mickle as a leader in the new generation of horror. Specs and supplements haven't been revealed yet, but suggested list price for the Blu-ray is $34.98. You can find the latest specs for 'Stake Land' linked from our Blu-ray Release Schedule, where it's now indexed under August 2.